This guide will help you to conduct research on themes this semester of World/Public Health, Climate Change, and Immigration. A database is like a "bank" - but instead of money, it contains "good information." The sources found in databases are chosen by EXPERTS in the field. This helps you to guarantee that the sources you find are good sources, saving you time and frustration. It brings together many different sources from many different places and allows you to search across sources on a certain topic. Searching in a database is similar to searching on the Internet. 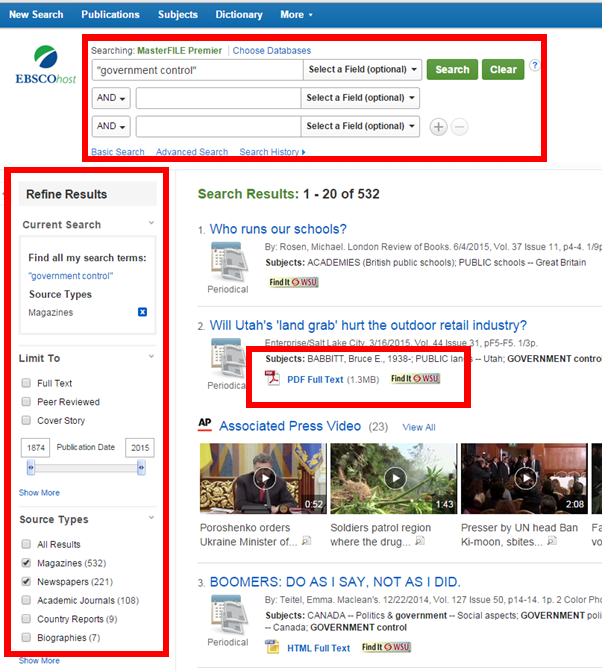 You will use a "search box" to type in your keywords, and you will get a list of results. These results each come from other sources - so, for example, the source does not come from "Academic Search Complete" - rather, you found the article from another resources (Washington Post, New York Times). This database contains resources from a variety of different disciplines. You can search for scholarly articles and also magazine and newspaper articles, in addition to other resources. This database provides reports - including statistics, examples, graphs, and more - on current issues and events. It is a very useful place to find facts! This database provides numerous in-depth encyclopedia articles on nearly any topic. Here you can find up-to-date newspaper articles from publications around the world. Here you can find both up-to-date and historical newspaper articles from publications around the world. Almost all databases you use will have a way to "refine" or narrow your results to only show those of a certain format (magazine, newspaper, book), year, geographical area, and more. Look on the side bar of the results - that is normally where you will find it.